← What does Yoda have to do with your dreams? The term ‘Cobra effect’ stems from an anecdote set at the time of British rule of colonial India. The British government was concerned about the number of venomous cobra snakes. The Government therefore offered a reward for every dead snake. Initially this was a successful strategy as large numbers of snakes were killed for the reward. Eventually however the Indians began to breed cobras for the income. When this was realized the reward was canceled, but the cobra breeders set the snakes free and the wild cobras consequently multiplied. The apparent solution for the problem made the situation even worse. A similar incident occurred in Hanoi, under French colonial rule, where a program paying people a bounty for each rat pelt handed in was intended to exterminate rats. Instead, it led to the farming of rats. But how does colonial times relate to modern talent engagement? This is where hyper incentivization, or also known as over justification and replacement bias, comes in to play. It is also a common theme that is taken very seriously among our gamification implementations on talent. An incentive, or lack the lack of it, changes motivation. When an individual is offered incentives, which could be both intrinsic or extrinsic, it has an impact on how she reflects on herself. If she is happy doing what she does because she enjoys doing it, and she is offered an incentive on top of it, then she starts doing it more for the gain and less for the joy. Eventually these incentives replace personal motivation. What’s worse is that now the incentive has to be permanently increasing, because it is not for the joy anymore, but the reward. The initial aim was to motivate her more, hence the incentives, but at the end it resulted in a situation that is worse. It often takes more than a year or two for a person to go through the destructive process of hyper-incentivization and the lack motivation at the end is usually tied to more recent events. This makes the cobra effect a hard to notice enemy of motivated talent and results in higher turnover rates for businesses, especially very large businesses. How to avoid the Cobra Effect? It is actually quite simple; just measure it. The first step is understand what really motivates the talent and how much of it is intrinsic vs. extrinsic. This can be done by a combination of quantitative tests and qualitative observations. The next step is to nurture existing motivations and build on them; instead of offering “pre-fabricated incentive packages”. But, motivation without guidance is a recipe for self-destruction. Therefore, the next step is to guide and mentor the talent into new challenges while constantly measuring satisfaction and stimulating his intellect. Measuring and evaluating your talent pool has a cost that will take away from your budget; that’s true. But how about the cost of not measuring? What about the opportunity cost of losing a talent? Unfortunately, opportunity cost is not on your balance sheet and your accountant doesn’t know about it. Yet, it is one of the highest, like a snake at night, a cobra. 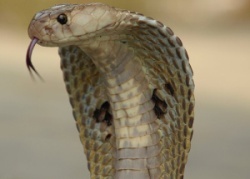 British rule of colonial India could have avoided the cobra effect by monitoring snake population and reducing the reward to a point that the cost and risks of farming cobras are higher than the reward itself. In the end they paid much more than the cost of keeping an eye on the snake population. Plus, they lost the opportunity of not having snakes. Double bad. Talent is your biggest asset. That’s why, at Sector Five we work as strategic partners and we strive around the clock to bring you the best of the best. Thus, we want to make sure they stay with the best. Don’t let the cobra effect hunt your organization down silently, and account for your opportunity costs. It is a sunny afternoon here in San Francisco and 6 a.m. in Tokyo. Once more, a brand new exciting day is about to start for Sector Five, in fact it never ends. This entry was posted in Business, Game Theory & Gamification, Ideas, Talent Engagement and tagged cobra effect, game theory, Gamification, talent. Bookmark the permalink.